Philadelphia, PA -- After three weeks of her untimely death, Ghanaians in USA finally gathered in Philadelphia this past weekend to pay their last respect to their friend, sister, brother, mother, grandmother and wife,Mrs Mary Kusi-Appouh aka Abena Frankomah and also affectionately called Sister Mary. The two-day event began on Friday evening, March 19th with a viewing at Francis Funeral Home in Philadelphia and then on Saturday, the 20th, there was another viewing and Church Service at her place of worship, the United Ghanaian Community Church and followed by the traditional funeral rites at the African Cultural Center, Philadelphia. Tributes were poured by family members, co-workers, friends and the Ghana Nurses Association of Philadelphia. 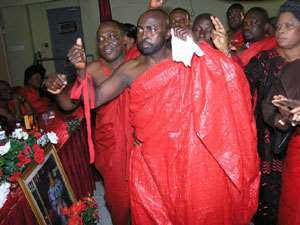 Among the mourners were Dr. Ohene-Frimpong of Children's Hospital of Philadelphia, Rev. Dr. Ofosu-Donkoh, UGCC, Mr. Charles Nimmo N-Mensah of Ghanaweb.com, African International Association, Ghanaian Association of Delaware Valley, Ga Adangbe Association of Delaware Valley, Novinyo Habobo and other Associations and churches in the USA. Special thanks goes to Mr and Mrs Paul Appiah, Nana Osei and everyone in Philadelphia and across the USA who helped in diverse ways to help make this occasion successful. The body of Mrs Kusi-Appouh has been flown to Ghana for burial.